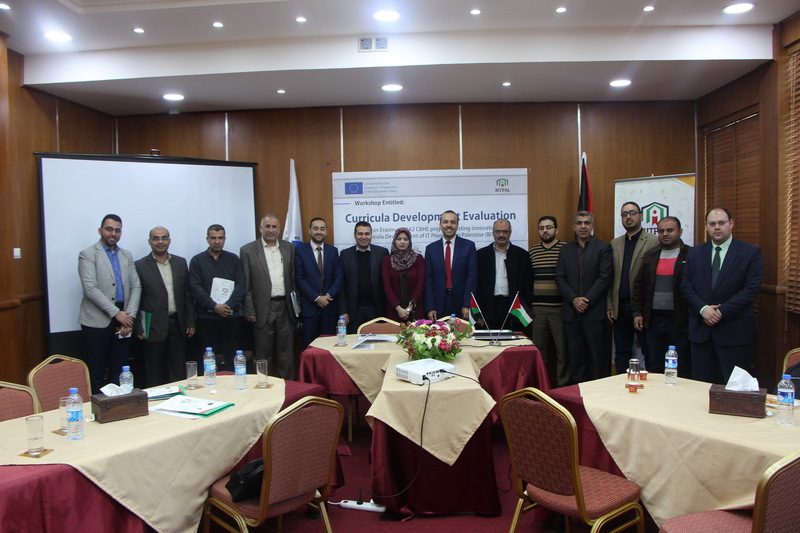 On 7 March 2018, the BITPAL Coordinator institution, University College of Applied Sciences (UCAS) organized the third workshop entitled “Evaluation of Curriculum Development Process” in framework of Erasmus+ KA2 CBHE project “Boosting Innovation in Curricula Development of Information Technology programs in Palestine (BITPAL)”. Participants from BITPAL partners: University College of Applied Sciences (UCAS), Islamic University of Gaza (IUG), Al-Azhar University (AUG), Al-Aqsa University (AQU), Gaza University (GU), University of Calabria (UNICAL), Palestinian Information Technology Association of Companies (PITA), and representatives of all Palestinian incubators in Gaza attended the workshop in UCAS. Prof. Rifat Rustom, the UCAS Rector, welcomed the attendance and expressed his appreciation to all efforts of the technical committees to achieve the development package and proceeding the project work. Finally, he thanked the European commission that supported this project and the National Office for the Erasmus Program in Palestine; he added that this project is one of the most important projects coordinated by UCAS which support the curricula development and the technological progress in Palestine. The project coordinator, Dr. Ahmed Abdalaal thanked all partners for their efforts during the previous months of the project where BITPAL team has finished the development of 11 programs in 5 partner universities with high quality level of methodology and training. The first session of the workshop started by Dr. Kholoud Elbasth (GU), moderator of the session, introduced the speakers to talk about the development evaluation; Prof. Dr. Samy Abu Naser from AUG (Computer Engineering committee coordinator) presented an overview about the Computer engineering curricula development evaluation for three programs developed under the project: computer engineering of AUG, Computer Engineering of IUG, and Information security engineering of UCAS. Then Prof. Dr. Alaa El-Halees from IUG (Computer Science committee coordinator) presented an overview about the Computer Science curricula development evaluation for four programs developed under the project: computer science of AUG, IUG, AQU, and GU. The first session ends with the presentation of Mr. Mohammed Al-Madhon (UCAS), coordinator of Diploma programs technical committee, who talked about the curricula development evaluation of the diploma programs in UCAS, GU, and AQU. The Second session started by Dr. Mohamed AwadAllah (AQU), moderator of the session, introduced the speakers to talk about the private sector, European partners and incubators contributions in the development evaluation; Dr. Angelo Furfaro from UNICAL presented a summery for the key findings and detailed feedback about the Computer engineering curricula development evaluation for three programs developed under the project. Then Ms. Lina Shamia from PITA highlighted the private sector contributions in the curricula development evaluation for all programs. The Second session ends with the presentation of Mr. Basel Qandeel, Manager of Business and Technology Incubator (BTI), who talked about the Palestinian incubators role in the implementation of the Entrepreneurship and Freelancing Course which added as new course for all programs. Dr. Ibrahim Sokar (GU) concluded the main recommendations and future steps for the curricula development process as follows: The workshop approved the 11 programs. As next steps, each program has to be approved from the responsible administrative in its own academic institute, then send it to BITPAL coordinator in order to forward it to the Palestinian Accreditation and Quality Assurance Commission (AQAC) for final approval.